Major: I’m pursuing a bachelor’s in mechanical engineering. Where did you intern? What did you do there? I interned at Michigan State University in their Summer Research Opportunities Program. The program focused on preparing students for graduate school. Apart from doing research with a faculty adviser in a lab, I attended workshops on topics like applying to graduate school, writing research papers, posters, leadership, career options and professional development in general. I also attended several faculty seminars and networking events with graduate students and faculty which explained what to expect from graduate school. Every week, my team and I presented our projects to practice our presenting skills for the Mid-SURE research conference that took place at the end of the program. Two graduate students were each assigned to me as my mentors. They helped me improve drafts of my resume, personals statement, research posters and papers, and infographics. How did you get your internship? 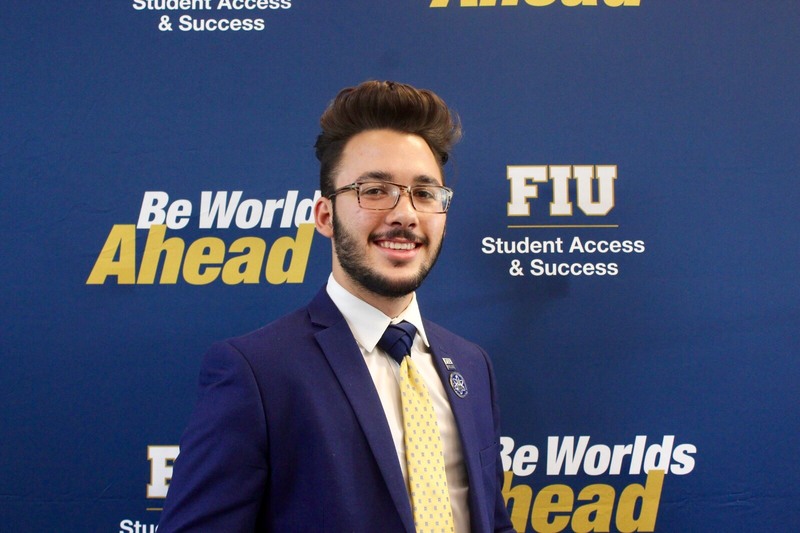 I received this internship by applying to the FIU McNair program in fall of 2017. This program aims to help underrepresented minorities and first generation students go to graduate school and do research. When I was accepted into the program, I was notified of an opening in the MSU Summer research opportunities program, where I was later accepted. What advice do you have for those beginning the internship process? Apply to as many internships as possible, even if you think you do not have a chance of getting the position. There are lots of internships available but some of them are harder to find, so look at company websites and search for research internships at universities and national labs. There are also opportunities available internationally such as DAAD RISE for internships in Germany. Ask all your friends, professors, and Career and Talent Development for internship opportunities they know of because there are a lot more than you can find on your own. Take the time to work on your resume and get it looked over by Career and Talent Development at FIU. Use the resources you have available and go to workshops and ask your peers and professors for advice on applying to internships. What projects did you work on? My project was to make the hardware for and design a swarm of robots. Swarm robotics is basically when you have multiple robots working together to complete a task, similar to ants and bees that overcome their individual capabilities by communicating with each other and working together. 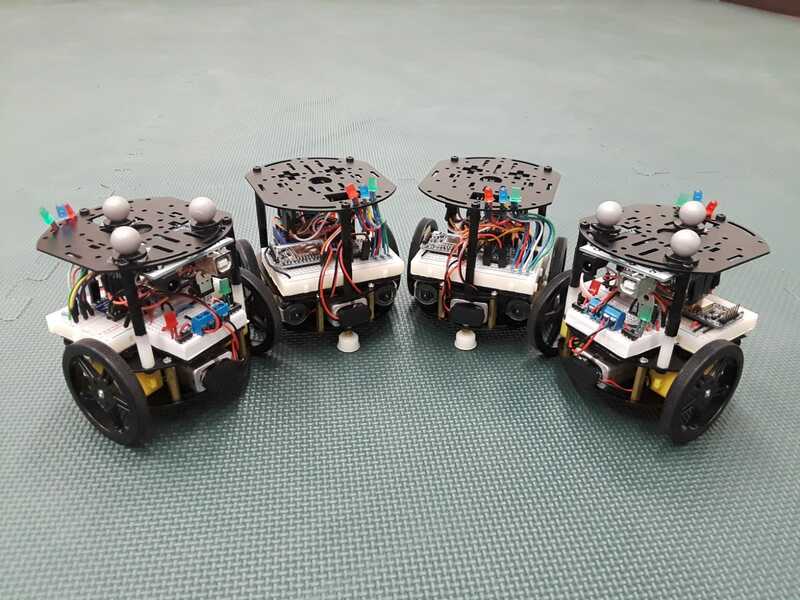 The problem is that there are not many commercial options to buy a swarm of robots to do research with, and the lab was using Harvard Kilobots, which cost $100 each. I made a more affordable robot that we could assemble easily and is based on an open-source hardware called an arduino making it easy to use by researchers focusing on the algorithm and software aspect of swarm robotics. Swarm robots designed by Daniel Enrique Martinez. How did your internship connect back to your coursework? I used some of the dynamics I have learned to calculate how to move the wheels of the robots for them to move the way I wanted them to. Other than that, I found it was mostly the work ethic I developed to succeed in my classes is what most helped me with my project. My adviser didn’t enforce a schedule on me so it was crucial for me to organize myself and be disciplined in accomplishing my tasks. What was the coolest thing about your internship or that happened during your internship? Getting to meet and talk to different professors and students at another university really gave me a lot of insight on the different career opportunities and paths available and all the cool work being done across the globe. It really helped me decide to pursue a Ph.D., and I learned a lot about life and myself during my internship. What did you learn about yourself? I learned that I prefer to work in a lab environment where I am exposed to people working on different projects. Talking to others about their projects often gave me inspiration and ideas for ways to improve my own project and working with other students helped me learn a lot of new skills. How did the position increase your professional confidence? The weekly presentations challenged me and it was difficult, at first, to respond to questions about my project, but that process helped me gain a better understanding of my project and how to present my research; so by the time I presented at my first research conference, I was very comfortable talking about and answering questions about my project. 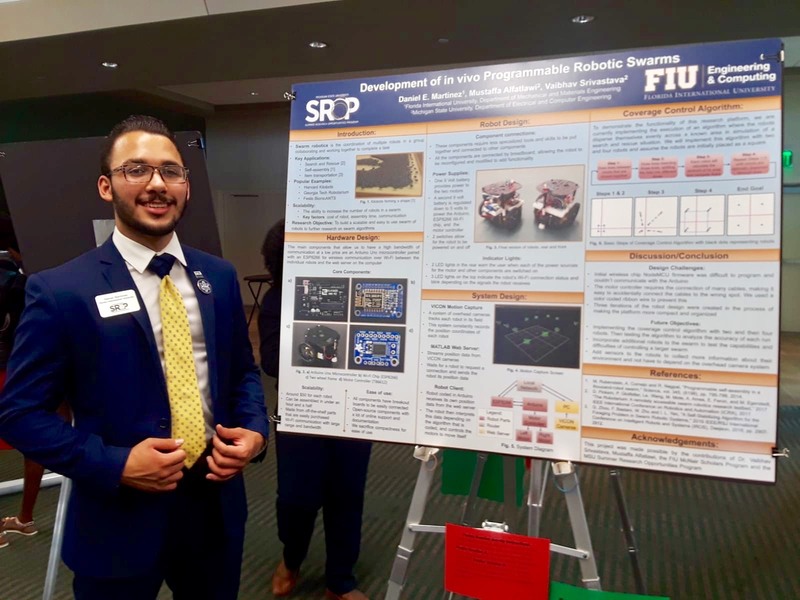 Daniel Martinez showcasing his work on “Development of in vivo Programmable Robotic Swarms”. How did you expand your professional network? I met several faculty members, graduate students and interns that share my passion and I continue maintaining a collegial relationship with. I gained new mentors and peers that I can learn from and work with. How did it help you prove yourself in the “real-world?” I created something that is now helping other researchers, and being able to assist the students further advance my project is really fulfilling and makes me feel that I am capable of contributing to the scientific community.